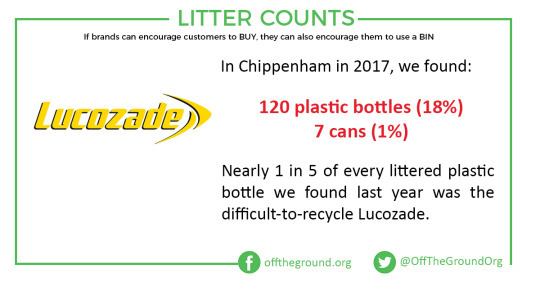 Lucozade is one of the most common brands we find in Chippenham, with nearly 1 in 5 of the plastic bottles found in 2017 belonging to the sports drink behemoth. What makes this even worse is that Lucozade often gets the crown as one of the most difficult items to recycle: while the bottle itself is recyclable, the outer sleeve is made from a different type of plastic. Supporting deposit schemes: There needs to not only be a willingness to get behind such schemes, but also to ride the inevitable ups and downs that will come with a new process. Schemes likewise need to be inclusive, not just focusing on plastic bottles but also aluminium cans and glass bottles. Encouraging consumers to change their behaviour: Switching to a deposit return scheme will require behaviour change, as will breaking the entrenched habits around littering. Telling customers what to do with waste products (use a bin or recycle) needs to be explicit at the point of purchase, without reliance on the Tidy Man hieroglyph. Re-engineering packaging: Packaging as a whole needs to be re-thought and re-considered. Can it be made of something that will degrade faster? Can it be made as one piece instead of two or more? Can it be designed specifically to be re-used in some way? The brand to look out for next week is Red Bull. Although once the top energy drink in Chippenham, it does have some competition for the other brands on the list, especially Monster, Relentless, and Rock Star. 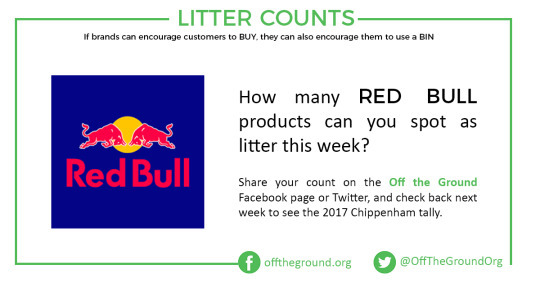 I would love to see all of the energy drink companies target their customers with a positive message about using a bin and recycling, and Red Bull specifically discard their adverts that seem to invite littering.